Lending by Chinese banks fell sharply in the first three months of the year after the government's efforts to clamp down on new loans proved successful. Banks lent 2.6 trillion yuan ($381bn; £247bn) between January and March, a 43% drop on the 4.6tn yuan they lent a year earlier, the central bank said. The state is trying to curb lending to prevent the economy from overheating and prices from rising too fast. 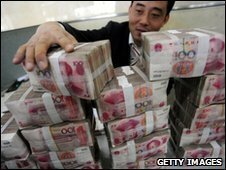 It has set a limit for lending for the whole of 2010 of 7.5tn yuan. This is well below the 9.6tn yuan lent last year. Much of this lending boom was sparked by government stimulus measures. At the end of 2008, the government announced a 4tn-yuan stimulus plan to boost the domestic economy. Partly as a result of the stimulus measures, the economy grew by an impressive 8.7% in 2009. The government is now keen to rein in spending to cool growth. It is also concerned about inflation, which hit a 16-month high of 2.7% in February. In January, the government ordered banks to hold more cash in reserve, while state media reported that it had ordered banks to stop lending altogether for the last 10 days of the month. The central bank also said on Monday that China's foreign exchange reserves hit a record $2.5tn (£1.6tn) at the end of March. This was despite the fact that the country recorded its first monthly trade deficit in nearly six years. Rising volumes and prices of raw materials left China with a deficit of $7.2bn in March, the bank said.